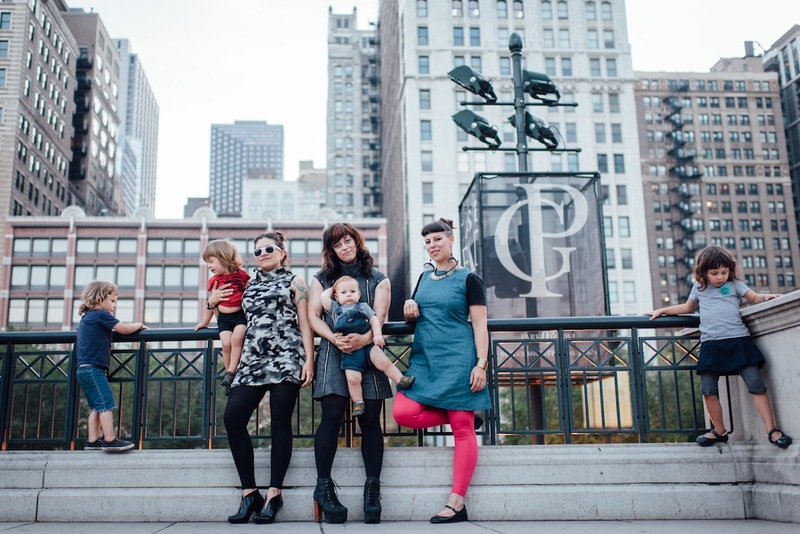 Frustrated by the lack of alternative options for stylish breastfeeding mothers after the birth of her own children, Chicago-based former art restorer Andrea Newberry took to the Internet, taught herself to sew, and started her own line of edgy wear for the punk rock mom. Leche Libre is a Mad Max version of post-maternity wear, and cool enough that even non-breastfeeding women are drawn to her unique designs. I had a chance to chat with Newberry over email about her journey from post-partum to fashion designer, and then some. What was your thought process in starting your line of clothing? 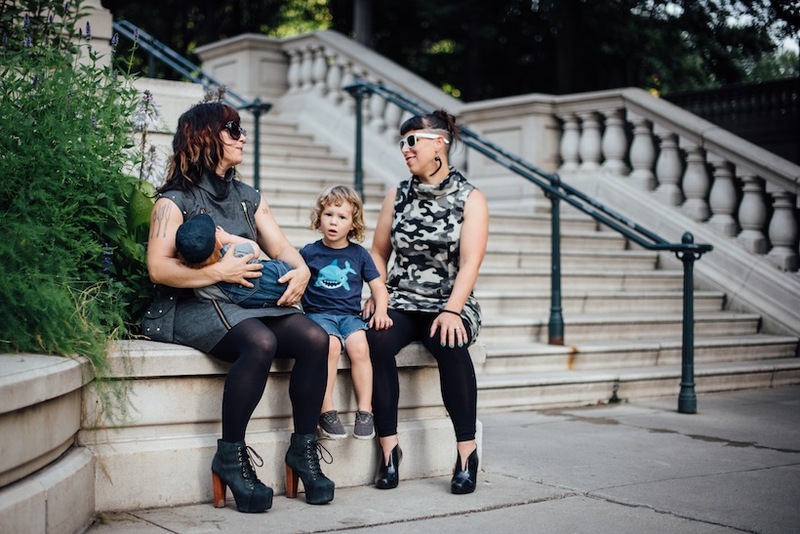 Andrea Newberry: After the birth of my first kid I had a really hard time finding clothing to easily breastfeed, and the ones that were made me feel frumpy and completely like a different person. My personal style is edgy, punk, and urban but the clothes that were available were super delicate, flowy and soft looking. I wasn’t sure who I was anymore as a new mom and I couldn’t even wear clothing which made me feel like me. I was so overwhelmed taking care of my baby that the thought of taking care of myself seemed impossible, so I just sort of went with what was available but I felt like I was completely losing myself and it was a depressing feeling. After the birth of my second child, I knew there had to be a better way. I was just learning to sew at the time, so I started making a few things for myself with breastfeeding access, and whenever I would wear them out I got so many compliments about the design. People would freak out when they realized my dress was functional for breastfeeding. I wanted to see if other women were having the same issue. I posted a survey on my Facebook page and asked friends to share. I got 500 responses within 48 hours. I knew I was on the right track and should keep going. I spent the next couple of years teaching myself sewing, fashion design, and fashion business to be able to launch Leche Libre in December of 2014. On your website you describe the ethos of Leche Libre’s brand as ‘based on the concept of discrete anti-authoritarianism.’ Could you tell me more about this? AN: One thing which has always irked me about being a woman, and listening to the struggles of my women friends, is that we’ve been taught, both subtly and in overt ways that we need to ask permission for everything we do. I find myself constantly apologizing for asking questions or taking up too much space. Growing up as a woman in our culture there is this feeling that you can’t be too loud, you have to be demure. Be beautiful, but don’t say too much. When it comes to standing up for ourselves, whether it’s asking for pay raise or encountering negative feedback for breastfeeding in public, it’s often hard for women to assert our rights. Discreet anti-authoritarianism is about empowering women to take up our space and do what we need to do for ourselves and our children. Breastfeeding in public is legally protected, so really it’s just cultural norms we’re up against. As a woman, the act of going against social norms is always a subversive act and can be stressful. I want Leche Libre to represent a powerful strong motherhood. If women are taught to be quiet, then we’ll just quietly and discreetly go about the business of living our lives the way we want and not giving in to negative feedback telling us to cover up and be ashamed of our bodies. I design my clothing to make it super easy to breastfeed discreetly, so you can just go about living your life and do your thing and not have to worry. So it’s like a marriage between fashion and activism, what a fascinating idea. Do you have a background in fashion? What went into starting a business like this? AN: Prior to this, I had no experience in the fashion industry at all. If you had told me five years ago I would be starting a fashion line, I would have laughed in your face. I started this for two reasons: I felt the lack of clothing for breastfeeding women and I wanted to make clothing which fit that need. The second reason was to help pull me out the post-partum depression I was experiencing after my son was born. In two years, I had gone from being a working woman with a dynamic urban social life to a stay at home mom with two children under the age of two. I loved being a mom, but I felt like I had disappeared as a person. I was always a creator and maker of things, so I decided to take on the ambitious project of teaching myself to design clothing to try and start a small Etsy shop selling clothing for breastfeeding as a way to get myself out of my deep depression. I threw myself into it. It was very hard and exhausting. I watched Project Runway to understand the process, and watched YouTube videos to learn how to sew in zippers. My son was a very fussy baby so I worked with him strapped to my back in a baby carrier. I would swap childcare with friends and take any spare moment to work on my project. As I went on, I knew I wanted something more than just a small Etsy shop and I’ve worked to launch Leche Libre as a professionally manufactured fashion line. As I went through the process, I started to get a better handle on my new self as woman and mom. I needed the business project to help me remember myself and I want to bring that into my clothes and help other new moms regain themselves right away so they don’t have to go as far down the rabbit hole as I went. I love the strong lines and bright colors of your clothing. What inspires your designs? 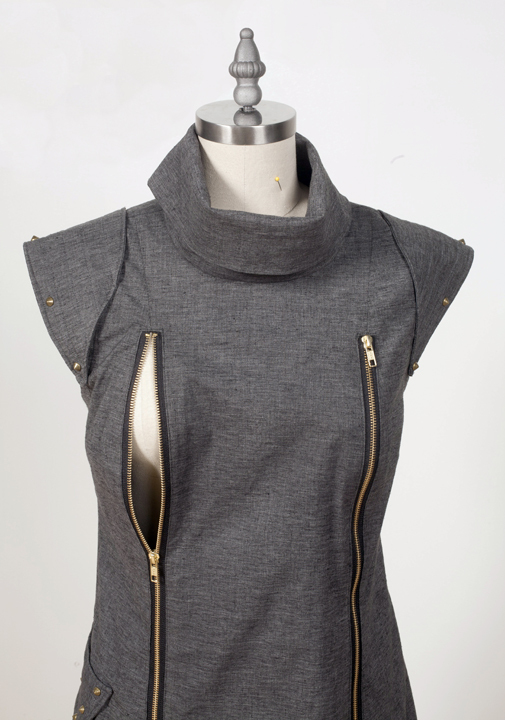 AN: Like most products for moms, breastfeeding apparel is designed in a very soft maternal way. I want to represent modern motherhood more powerfully. Power is often represented in masculine imagery, so I like the idea of playing with inserting more masculine and hard-edged themes into my designs for moms. 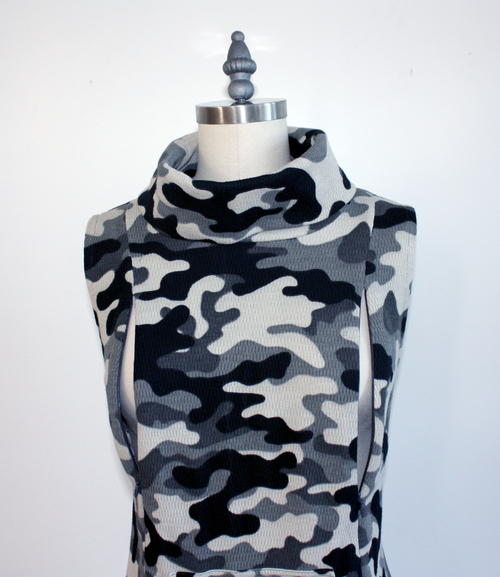 I like to play around with the mixing of the nurturing of breastfeeding with themes traditionally representing a more masculine aesthetic like camouflage prints, studs, and hard metal zippers. For my new sweatshirt design, I was playing with the idea of making it look like army surplus for space marines. If women feel beautiful in Leche Libre garments, that’s awesome, but my main goal is to make them feel powerful. I also like to look at men’s streetwear brands and skateboarding brands to see how they’re presenting a certain kind of lifestyle of rebellious freedom. I want to infuse a bit of rebelliousness in my clothing to empower women to thwart negative cultural conditions which limit our growth as individuals. Skateboarding has always skirted social constrictions and it’s a culture which is full of rebel rousing and has a fresh feeling of freedom, youth and vitality. I’d like to represent the modern mom lifestyle in a more dynamic and punk rock kind of way. 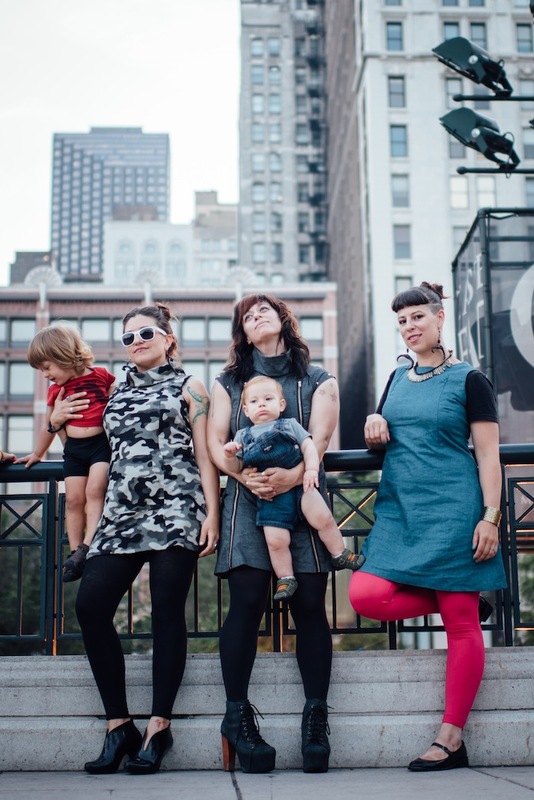 Motherhood is rarely represented as cool. Like once you have a baby you become some old washed up Mommy, devoid of sexuality and fun. Who cares about being soft and beautiful? Let’s just get rad. 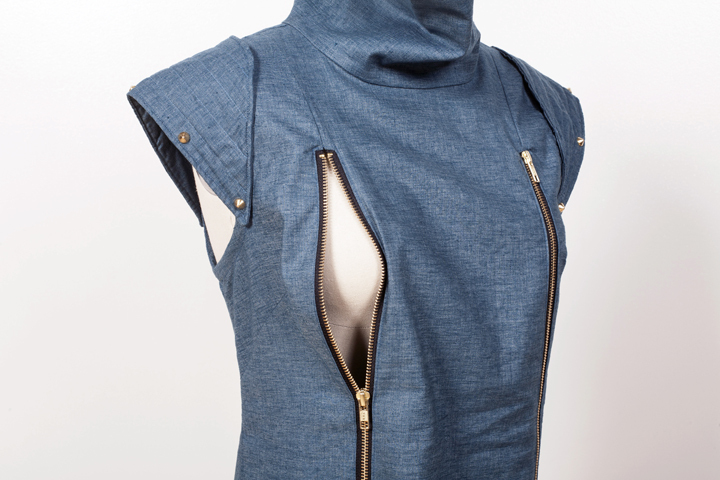 I want women to feel the vitality and freedom of being able to breastfeed on the go and look super cool while doing it. “Let’s get rad.” I love that! And when it comes to your clothes, what kinds of fabrics and materials do you use? AN: During my beta testing phase, I’ve been experimenting with different materials. When I first launched, I was using an all organic hemp/cotton blend with recycled poly. It’s a super high quality sustainable material, but it pushed my price points too high for the average mom. I’m always walking the tightrope of running an ethical business with my strong desire to make the Leche Libre brand as accessible as possible. I’m working with different materials, including sourcing from remnant houses which are left overs from large manufacturing. By using these materials, we keep the materials out of the landfills. I’m working with a small manufacturer out of Milwaukee. I’m on a first name basis with all the women who will be making my collection and they’re awesome. I’m also in the process of starting a relationship with Work Shelter, an amazing fair trade manufacturer in India which gives women at risk a safe place to live and get professional training in production sewing. I love the idea of empowering women on both sides of the process! What kind of reactions do you get when out and about in your line? 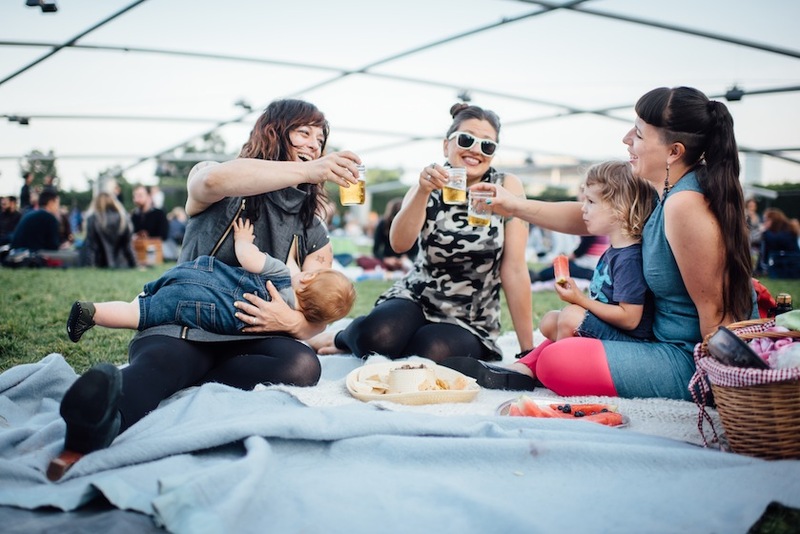 Have you experienced any of that problematic negative behavior towards women breastfeeding in public? AN: I’m always amazed at how much people love the dresses whenever I wear them out. I have people commenting just on the style and then when they find out they are functional breastfeeding apparel, they freak out. They talk about how easy it is to look good and take care of their kiddos while out and about. I’ve gotten feedback from other women that they get a lot of positive comments from people about the fact that the dresses are functional for breastfeeding. It seems to be a conversation starter. I have experienced negative behavior in the past when breastfeeding in public, mostly through passive aggressive or weird comments. Most of the really hurtful negative interactions I’ve had, have been online with comments about the fact that my son looked too old to be breastfeeding and how women should cover up. I feel like people are a lot more quick to criticize online than in real life, but all the criticism adds up and can make you insecure on and offline. I think the best thing we can do is to create supportive networks which empower us and not give into the messaging which takes away our power. You do a lot of activism around the issue of breastfeeding in public, why is this an important issue for you to speak openly about? Does it shape the work you do when designing and promoting your company? AN: I feel as though breastfeeding in public is a very key struggle for feminism and equality. We are shamed for breastfeeding in public and told to cover up, yet there are two-story billboards over the expressway of women in little more than underwear. Our culture wants to use female sexuality to sell stuff, but then shames us for using our breasts for what they are meant for. It’s very upsetting to me. By normalizing breastfeeding, not only are we doing what is best for our babies, as well as using our bodies for what they are naturally designed to do, but we are also reclaiming ownership of our bodies and striking a blow against the objectification and sexualization of women’s bodies. Leche Libre is a mission of passion for me. I want to make it easier for women to live an empowered experience by being able to regain ownership of their individuality after having a baby, by loving the look of their body after having a baby and by being able to do what they want with their body in a way which connects them with the ancient power of birth and breastfeeding that all mothers carry in our bodies. I also just want to help women to look and feel super cool. Cause I think women and moms ARE super cool. I want to make it as easy as possible for breastfeeding moms to step out with confidence and style without losing their edge. Many thanks to Andrea Newberry for taking time out to chat with me about her fantastic designs and process. For more information about Leche Libre and to snag one of these funky dresses check out their website here. This piece originally appeared on Huffington Post Style in July 2016. “While The Dirt Cure is geared towards parents healing their children, the plethora of advice and information is applicable to everyone living in modern American society, making The Dirt Cure a must-read for anyone who cares about what goes into their, and their children’s, bodies.” Read full post. “Immigration doesn’t only externally displace a person from familiar surroundings, language, and culture, it also internally displaces us into a cultural and linguistic limbo that at times can be a horror to navigate. Lives become split into befores and afters, and even if you inhabit a closely-knit immigrant community, immigration forces us into liminal existences often on the social and cultural margins that create perceived differences between us and them, and even causes ruptures between us and the homeland that grow more and more apparent the longer one lives outside.” My 35th article for HuffPost, published in July 2016. Read full post. “While food is one of the two fundamental pillars of human survival — water being the other — how often do we stop to think about food in a socio-cultural sense? For Zeynep Kilic, sociology professor, Fulbright Scholar, and Turkish transplant in Alaska, Turkish food has been the link between her new world in the US and her upbringing in Turkey…” My 34th article for HuffPost, and my first feature for HuffPost Taste. Read full post. “Bowie gave me permission to be weird. Prince gave me permission to be happy.” My 32nd article for Huffington Post published in April 2016. Read full post. “If you don’t have anything globally inclusive to say after an incident, don’t say anything at all. Please, and thank you.” My 30th article for Huffington Post, published in April 2016. Read full post. “Donald Trump and his citizen minions have forever changed the perception of the United States both inside and outside, and no matter who gets elected president this year or in the future, the damage Trump has done is irrevocable.” My 29th article for Huffington Post. Read full post. “‘Every single woman is an advocate for women, no matter what her job, role, title, and sphere — I am simply playing my role,’ says space gynecologist Dr. Varsha Jain.” My 28th article for HuffPost, and my first feature for the HuffPost Science column, published in March 2016. Read full post.